﻿ HuntingNut » Forums » Hunting » Big Game Hunting » Learning What It's All About. Learning What It's All About. Posted: Wed Jan 01, 2014 7:28 pm Post subject: Learning What It's All About. Nat is learning what it's all about. 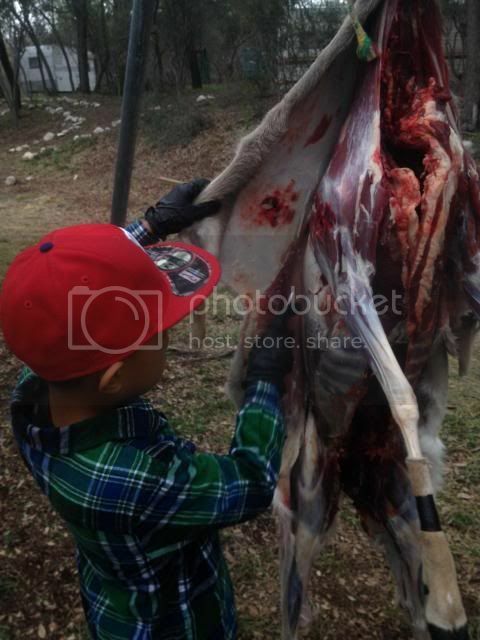 This is seven yr old Nate skinning his second doe of the season. Took her with (what used to be Nana's 250 Savage) his trusty 250 At 115 yds. Posted: Thu Jan 02, 2014 12:54 am Post subject: Re: Learning What It's All About. that is truly awesome dude. I surely hope he enjoys the taste of steak. those memories you are building will last for ever, good on you. Posted: Thu Jan 02, 2014 6:51 am Post subject: Re: Learning What It's All About. That is magnificent Clint. 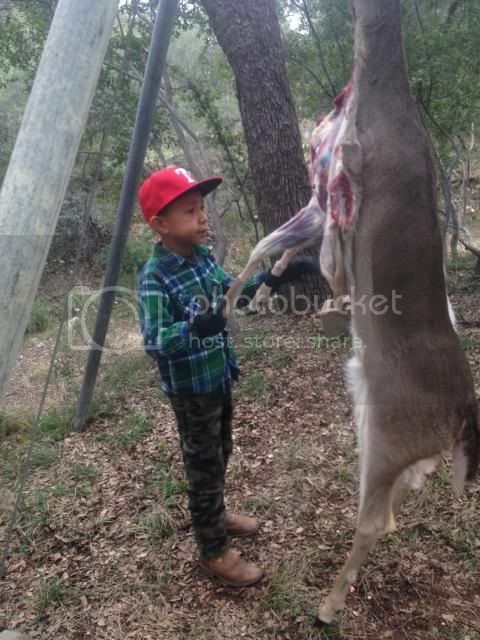 The young fella obviously enjoys his hunting and is not afraid to get in there and do the necessary work after the kill. You are building a good solid grounding for his future hunting days, and those of his kids. Well done mate. Posted: Thu Jan 02, 2014 8:38 am Post subject: Re: Learning What It's All About. Its great to have a hunting companion that can mentor! Posted: Thu Jan 02, 2014 9:44 am Post subject: Re: Learning What It's All About. ABSOLUTELY GREAT, Clint, that is awesome. Nate is blessed to have you to mentor him. 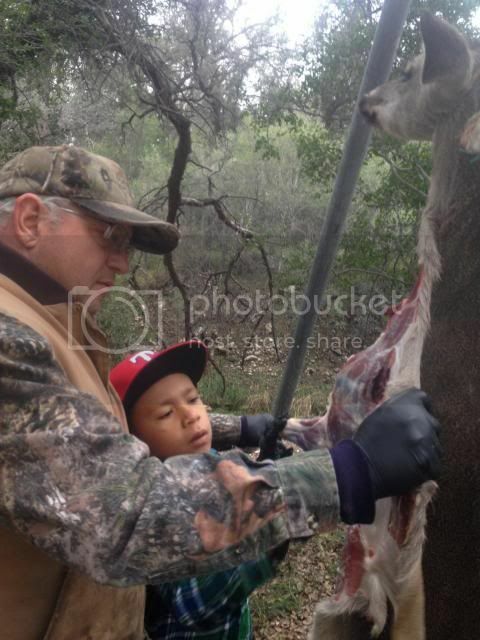 More kids need to learn that meat doesn't grow on trees and come naturally cradled in styrofoam and wrapped in plastic. Posted: Thu Jan 02, 2014 10:16 am Post subject: Re: Learning What It's All About. Great pics Clint. That's something he'll be telling HIS grandkids about. Posted: Thu Jan 02, 2014 2:58 pm Post subject: Re: Learning What It's All About. Good for Nate and great that you are showing him the ropes. Looks like he is doing a very nice job of it. Kudos to the both of you. Posted: Thu Jan 02, 2014 3:25 pm Post subject: Re: Learning What It's All About. I really like it when children are thought to hunt and skin their own animal, rather than sit in front of TV or computer game. It gives much hope to our future generation. You have done good Clint. Posted: Fri Jan 03, 2014 7:51 pm Post subject: Re: Learning What It's All About. Get youngsters interested in the outdoors stuff & they're far less likely to become "X-box" addicts. Posted: Fri Jan 03, 2014 8:04 pm Post subject: Re: Learning What It's All About. Great! I love to see pictures getting kids involved. Good for you guys! Posted: Sat Jan 04, 2014 1:20 am Post subject: Re: Learning What It's All About. Guys thanks for all the kind words. But this young man is the grandson of a friend of mine name Mike. Nat has gone coyote hunting with his grandpa and myself. He truely wants to learn to hunt and call coyotes. And does a heck of a good job. I try to take as many young people hunting as I can. I will tell Mike what a good job you all say he doing. Thanks guys.